Tabletop gaming in Broome County - board games, card games, role-playing games; if you play it on a tabletop, we approve. Hello, Broome County. I've slowly grown to love you. I've lived here for 12+ years. In that time, I have begun to treasure the Greater Binghamton Area for all of its peculiarities and all of its battered beauty. Broome is a good place with good people. 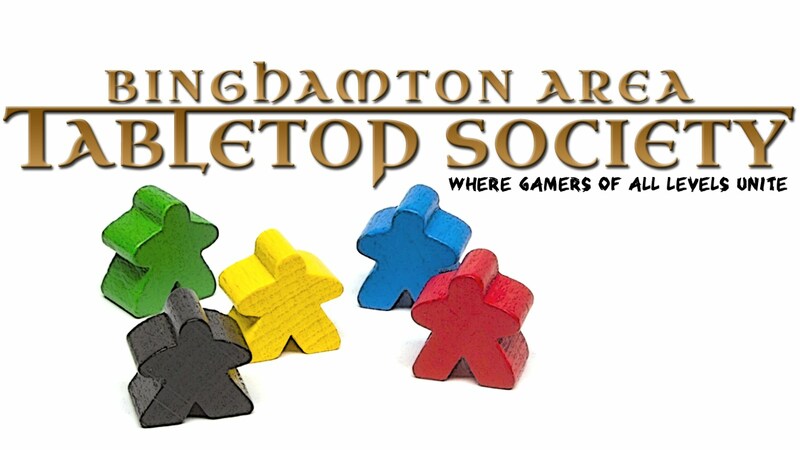 Binghamton Area Tabletop Society (BATS) is my effort at improving Broome County just a little bit. The sole purpose of BATS is to provide a regular, safe, public environment for playing tabletop games. Tabletop gaming fosters community. It brings people together away from electronics and away from social media (though I won't stop you from taking photos at game night and posting them to your Instagram account! as long as you're respecting the game and others at the table! ), away from all of the stupid distractions that keep us from looking at each other and from talking to one another. Playing games together is one way of making a human connection. Games can be wonderfully silly and social. Games can be brain-burningly brutal contests of strategic will. Games can be cooperative puzzle-solving endeavors. Playing games, all sorts of games, provides an opportunity to stretch the way you think and interact with others. It can be overwhelming for new or casual gamers to enter a hobby shop, especially when the majority of people there are playing Magic: The Gathering and/or Warhammer 40k. I'm glad that those games exist for the people who enjoy them, but those games are "lifestyle games" that simply do not appeal to the broader public. BATS exists for the gamer who enjoys a wide variety of games and wants to try new games. BATS exists for the person who may be curious about the wide world of new games, negotiation games, silly dexterity games, serious train games or economic games, science fiction games or historic simulations, dungeon crawls, word games, new takes on classic card games, roleplaying games about terrible decisions or awesome adventures, trading in the Mediterranean, or whatever, etc... there is seemingly no end to the variety of great games being created and released into the world right now. My own tastes skew towards abstraction and "perfect information" punctuated by forays into wackiness. Chess, Go/Baduk, Shogi, are all perfect games as far as I'm concerned. I also love medium-weight Euros, card-driven war games, light card games, Appendix N inspired role-playing, and dexterity games that are embarrassing for everyone involved. But BATS isn't about my personal taste. That's the beauty of it. BATS is for everyone. It's about creating a public space for all sorts of different gamers with all sorts of different tastes. If you enjoy playing games, you should be a part of BATS. You should be meeting other people who enjoy playing games. So that you can enjoy them together. Gamers in Broome County, old and new, can cease their isolation. Get out and meet new people. Find the people who like the games that you like. Find the people that introduce you to other games that maybe you didn't know you liked. Play games you love. Try new ones. By all means, continue to play games in the privacy of your home with friends and family, but you are robbing yourself of a wonderful experience if you neglect public gaming options. So, what are the public gaming options right now in Broome County? BATS hosts regularly scheduled public game sessions, open to everyone. We meet at Your Home Public Library in Johnson City every Monday night from 5pm to 8:30pm. We meet at Jupiter Games in Johnson City every Tuesday night from 5pm to 9:45pm. We meet at Water Street Brewing Company in Binghamton the first Saturday of every month from 1pm to 8pm. We meet at Park Terrace Community UMC in Apalachin the second Saturday of every month from 9am to 5pm 3pm. BATS supports all public gaming options in the area. We are very grateful to have Jupiter Games in Johnson City. If you're buying games in Broome County, there isn't a better place to do it than Jupiter. Make sure you check out their regularly scheduled weekly Friday night open gaming, 7pm until they kick you out. We're also glad that big box stores in the areas like Barnes & Noble and Target are increasingly carrying "hobby" board games. Both of these stores have cafe areas. Buy your games and then play them in public! Or bring them to the next BATS game night! The state of gaming in the Greater Binghamton Area has never been better than it is right now. If you're new to gaming or curious about modern gaming, check us out. We will patiently teach you games and do all that we can to make you feel welcome. If you've been playing games your whole life and check Boardgamegeek.com every day, well, what are you waiting for? Come join us.